Hanley. 1843. Illustr. Descr. Cat. Rec. Bivalve Shells. Hanley, 1843, Illustr. Descr. Cat. Rec. Bivalve Shells: 221. Lucena, 1951, Pap. Avuls. Dept. Zool. : 98. ‘Ferussac’ Hanley, 1843, Illustr. Descr. Cat. Rec. Bivalve Shells: 223. ‘Lea’ Hanley, 1843, Illustr. Descr. Cat. Rec. Bivalve Shells: 218. Hanley, 1843, Illustr. Descr. Cat. Rec. Bivalve Shells: 216. Turgeon et al., 1988, Am. Fisher. Soc. Spec. Publ. : 28. Williams et al., 1993, Fisheries: 10. Hanley, 1843, Illustr. Descr. Cat. Rec. Bivalve Shells: 345, pl. 13, fig. 58. ‘Lamarck’ Hanley, 1843, Illustr. Descr. Cat. Rec. Bivalve Shells: 90. Hanley, 1843, Illustr. Descr. Cat. Rec. Bivalve Shells: 93. Philippi, 1848, Abbild. Beschr. Conch. : 78. Clessin, 1879, Conch. Cab. : 108. Prime, 1895, Cat. Corbiculadae: 19. Clessin, 1879, Conch. Cab. : 212. ‘Lesson’ Hanley, 1843, Illustr. Descr. Cat. Rec. Bivalve Shells: 94. ‘d’Orbigny’ Hanley, 1843, Illustr. Descr. Cat. Rec. Bivalve Shells: 94. Hanley, 1843, Illustr. Descr. Cat. Rec. 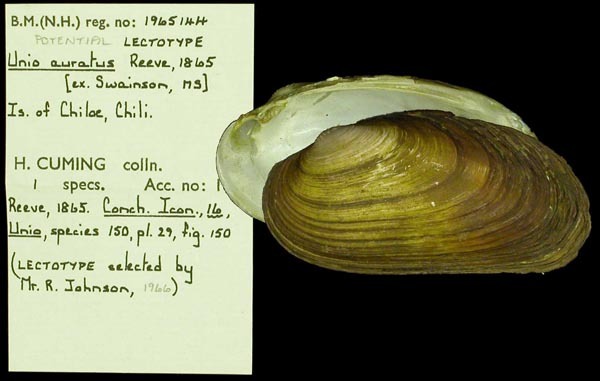 Bivalve Shells: ??. ‘Hinds Z.P. 1844’ Hanley, 1843, Illustr. Descr. Cat. Rec. Bivalve Shells: 251, pl. 24, fig. 34. ‘Jenyns’ Hanley, 1843, Illustr. Descr. Cat. Rec. Bivalve Shells: 91. ‘Leach, in litt.’ Prime, 1870, Amer. J. Conch. : 169. ‘Sheppard’ Clessin, 1879, Conch. Cab. : 13. ‘Jenyns’ Prime, 1895, Cat. Corbiculadae: 60 [as ‘Pisidium henslowianum’]. Dall, 1903, Trans. Wagner Free Inst. : 1463. Thiele, 1934, Handb. Syst. Weichtierk. : 853 . Kantor et al., 2010, Cat. Contin. Moll. Russia: 308 [as ‘Tellina henslowiana’]. Hanley, 1843, Illustr. Descr. Cat. Rec. 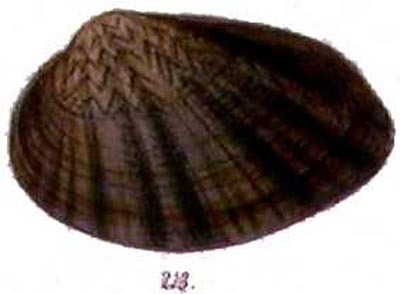 Bivalve Shells: 199 [as ‘Naia aurata’]. ‘Swain.’ Lea, 1852, Synopsis Fam. Naiades: 33 [as ‘Niäa aurata’]. ‘Swainson MS’ Reeve, 1865, Conch. Icon. : pl. 29, sp. 150. Type(s): FIGURED SPECIMEN BMNH_1965144, I. of Chiloe. Hanley, 1843, Illustr. Descr. Cat. Rec. Bivalve Shells: 193, pl. 23, fig. 57. ‘d’Orbig.’ Hanley, 1843, Illustr. Descr. Cat. Rec. Bivalve Shells: 212. ‘Lea’ Hanley, 1843, Illustr. Descr. Cat. Rec. Bivalve Shells: 196. Ferussac, 1835, Mag. Zool. : 27, 33. Hanley, 1843, Illustr. Descr. Cat. Rec. Bivalve Shells: 175. Hanley, 1843, Illustr. Descr. Cat. Rec. Bivalve Shells: 213. Hanley, 1843, Illustr. Descr. Cat. Rec. Bivalve Shells: 203. Hanley, 1843, Illustr. Descr. Cat. Rec. Bivalve Shells: 202, pl. 22, fig. 6. ‘Conrad’ Hanley, 1843, Illustr. Descr. Cat. Rec. Bivalve Shells: 178. ‘Rossm.’ Hanley, 1843, Illustr. Descr. Cat. Rec. Bivalve Shells: 205. ‘Say’ Hanley, 1843, Illustr. Descr. Cat. Rec. 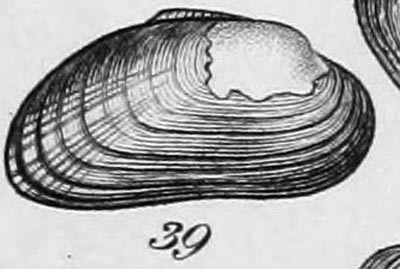 Bivalve Shells: 188. Hanley, 1843, Illustr. Descr. Cat. Rec. Bivalve Shells: 211, pl. 23, fig. 39. ‘Conrad’ Hanley, 1843, Illustr. Descr. Cat. Rec. 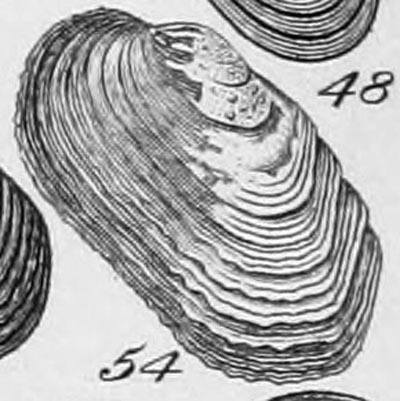 Bivalve Shells: 178, pl. 20, fig. 40. ‘Barnes’ Hanley, 1843, Illustr. Descr. Cat. Rec. Bivalve Shells: 175, pl. 20, fig. 26. ‘Lea’ Hanley, 1843, Illustr. Descr. Cat. Rec. Bivalve Shells: 200. Hanley, 1843, Illustr. Descr. Cat. Rec. Bivalve Shells: 193. *** NO OPINION *** — Hanley (1843: 91). Anodonta anatina Lam. — Hanley (1843: 216). Anodonta angulata Lea. — Hanley (1843: 222). Anodonta anserina Spix. — Hanley (1843: 222). Anodonta arcuata Ferussac. — Hanley (1843: 223). Anodonta benedictensis Lea. — Hanley (1843: 216). Anodonta blainvilliana Lea. — Hanley (1843: 222). Anodonta buchanensis Lea. — Hanley (1843: 223). Anodonta chaiziana Rang. — Hanley (1843: 220). Anodonta crassa Swain. — Hanley (1843: 222). Anodonta crispata Lam. — Hanley (1843: 217). Anodonta cygnea Lam. — Hanley (1843: 216). Anodonta cygnea, variety 1. — Hanley (1843: 216). Anodonta cygnea, variety 4. — Hanley (1843: 216). Anodonta cygnea, variety 5. — Hanley (1843: 216). Anodonta cygnea, variety 6. — Hanley (1843: 216). Anodonta cygnea, variety 7. — Hanley (1843: 216). Anodonta cylindracea Lea. — Hanley (1843: 223). Anodonta decora Lea. — Hanley (1843: 219). Anodonta edentula Lea. — Hanley (1843: 218). Anodonta elongata Swain. — Hanley (1843: 223). Anodonta ensiformis Spix. — Hanley (1843: 223). Anodonta esula Cristofori and Jan. — Hanley (1843: 223). Anodonta exilis Lea. — Hanley (1843: 224). Anodonta exotica Lam. — Hanley (1843: 217). Anodonta ferussacciana [sic] Lea. — Hanley (1843: 218). Anodonta fluviatilis Lea. — Hanley (1843: 217). Anodonta fragilis Lam. — Hanley (1843: 217). Anodonta georginæ Gray. — Hanley (1843: 223). Anodonta gibbosa Say. — Hanley (1843: 220). Anodonta gigantea Lea. — Hanley (1843: 219). Anodonta glauca Lam. — Hanley (1843: 221). Anodonta grandis Say. — Hanley (1843: 220). Anodonta incerta Lea. — Hanley (1843: 218). Anodonta latomarginata Lea. — Hanley (1843: 221). Anodonta limnoica d’Orbig. — Hanley (1843: 218). Anodonta magnifica Lea. — Hanley (1843: 215). Anodonta mortoniana Lea. — Hanley (1843: 219). Anodonta newtonensis Lea. — Hanley (1843: 219). Anodonta nuttaliana [sic] Lea. — Hanley (1843: 216). Anodonta obtusa Spix. — Hanley (1843: 221). Anodonta oregonensis Lea. — Hanley (1843: 219). Anodonta ovata Lea. — Hanley (1843: 219). Anodonta parishii Gray. — Hanley (1843: 222). Anodonta patagonica Lam. — Hanley (1843: 221). Anodonta pavonia Lea. — Hanley (1843: 218). Anodonta pepiniana Lea. — Hanley (1843: 220). Anodonta plana Lea. — Hanley (1843: 219). Anodonta porcifer Gray. — Hanley (1843: 221). Anodonta purpurea Valen. — Hanley (1843: 218). Anodonta salmonia Lea. — Hanley (1843: 218). Anodonta sinuosa Lam. — Hanley (1843: 224). Anodonta sirionos d’Orbig. — Hanley (1843: 221). Anodonta spixii d’Orb. — Hanley (1843: 221). Anodonta stewartiana Lea. — Hanley (1843: 220). Anodonta subcylindracea Lea. — Hanley (1843: 223). Anodonta suborbiculata Say. — Hanley (1843: 222). Anodonta tenebricosa Lea. — Hanley (1843: 224). Anodonta trapezialis [sic] Lam. — Hanley (1843: 220). Anodonta trigona Spix. — Hanley (1843: 218). Anodonta undulata Say. — Hanley (1843: 217). Anodonta uniopsis Lam. — Hanley (1843: 217). Anodonta wahlamatensis Lea. — Hanley (1843: 215). Anodonta wardiana Lea. — Hanley (1843: 220). Anodonta woodiana Lea. — Hanley (1843: 215). Castalia ambigua Lam. — Hanley (1843: 173). Castalia inflata d’Orb. — Hanley (1843: 173). Castalia quadrilatera d’Orb. — Hanley (1843: 173). Cyclas amnica Turt. — Hanley (1843: 89). Cyclas appendiculata Turt. — Hanley (1843: 91). Cyclas australis Lam. — Hanley (1843: 90). Cyclas calyculata Lam. — Hanley (1843: 89). Cyclas cinerea Alder. — Hanley (1843: 91). Cyclas cornea Lam. — Hanley (1843: 89). Cyclas elegans Adams. — Hanley (1843: 91). Cyclas fontinalis Lam. — Hanley (1843: 90). Cyclas lacustris Drap. — Hanley (1843: 89). Cyclas nitida Jenyns. — Hanley (1843: 90). Cyclas obtusalis Lam. — Hanley (1843: 90). Cyclas partumeia Say. — Hanley (1843: 91). Cyclas pulchella Jenyns. — Hanley (1843: 91). Cyclas rivicola Lam. — Hanley (1843: 89). Cyclas sarratoga [sic] Lam. — Hanley (1843: 90). Cyclas similis Say. — Hanley (1843: 90). Cyclas striatina Lam. — Hanley (1843: 90). Cyrena australis Desh. — Hanley (1843: 94). Cyrena bengalensis Lam. — Hanley (1843: 93). Cyrena carolinensis [sic] Lam. — Hanley (1843: 93). Cyrena childreni [sic] Gray. — Hanley (1843: 93). Cyrena cor Lam. — Hanley (1843: 92). Cyrena cyprinoides Quoy. — Hanley (1843: 93). Cyrena cyprinoides Gray. — Hanley (1843: 94). Cyrena depressa Lam. — Hanley (1843: 93). Cyrena fluminea Lam. — Hanley (1843: 92). Cyrena fuscata Lam. — Hanley (1843: 92). Cyrena jayensis Lea. — Hanley (1843: 93). Cyrena kecaudreni [sic] Lesson. — Hanley (1843: 94). Cyrena limosa Gray. — Hanley (1843: 92). Cyrena mexicana Brod. & Sow. — Hanley (1843: 94). Cyrena oblonga Quoy. — Hanley (1843: 94). Cyrena orientalis Lam. — Hanley (1843: 92). Cyrena papua Lesson. — Hanley (1843: 94). Cyrena paranicensis [sic] d’Orb. — Hanley (1843: 94). Cyrena rotundata Lea. — Hanley (1843: 93). Cyrena similis W. — Hanley (1843: 94). Cyrena sumatrensis Sow. — Hanley (1843: 94). Cyrena trigonella Lam. — Hanley (1843: 92). Cyrena turgida Lea. — Hanley (1843: 93). Cyrena vanikorensis Quoy. — Hanley (1843: 94). Cyrena variegata d’Orb. — Hanley (1843: 94). Cyrena violacea Lam. — Hanley (1843: 92). Cyrena woodiana Lea. — Hanley (1843: 92). Cyrena zeylanica Lam. — Hanley (1843: 93). Etheria caillaudi [sic] Fer. — Hanley (1843: 230). Etheria lamarckii Ferus. — Hanley (1843: 230). Etheria plumbea Ferussac. — Hanley (1843: 230). Galathea radiata Lam. — Hanley (1843: 94). Hyria avicularis Lam. — Hanley (1843: 214). Hyria browniana Lea. — Hanley (1843: 215). Hyria corrugata Lam. — Hanley (1843: 215). Hyria syrmatophora Sow. — Hanley (1843: 214). Iridina cœestis Lea. — Hanley (1843: 225). Iridina elongata Sow. — Hanley (1843: 225). Iridina exotica Lam. — Hanley (1843: 225). Iridina nilotica Ferrusac & Sow. — Hanley (1843: 225). Iridina ovata Swainson. — Hanley (1843: 225). Iridina rubens Desh. — Hanley (1843: 225). Modiola brasiliensis Ch. — Hanley (1843: 234). Modiola pulex Lam. — Hanley (1843: 238). Modiola securis Lam. — Hanley (1843: 234). Mycetopus siliquosus Spix. — Hanley (1843: 224). Mycetopus soleniformis d’Orb. — Hanley (1843: 224). 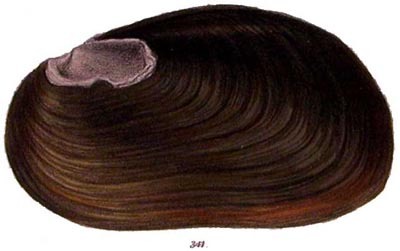 Mytilus confusus Ch. — Hanley (1843: 250). 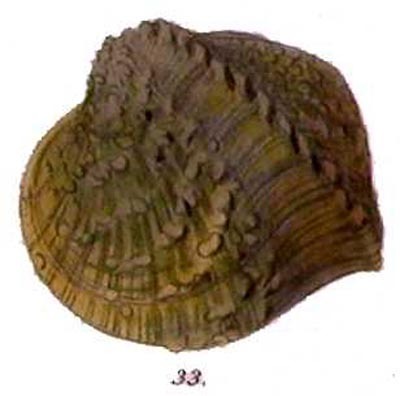 Mytilus edulis Linn. — Hanley (1843: 250). 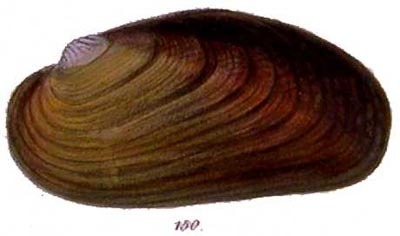 Mytilus galloprovincialis Lam. — Hanley (1843: 249). Mytilus minimus Poli. — Hanley (1843: 250). Unio acutissimus Lea. — Hanley (1843: 177). Unio alatus Say. — Hanley (1843: 174). Unio altilis Conr. — Hanley (1843: 190). Unio angustatus Lea. — Hanley (1843: 204). Unio angustus Lam. — Hanley (1843: 200). Unio anodontoides Lea. — Hanley (1843: 204). Unio apiculatus Say. — Hanley (1843: 178). Unio arctatus Conr. — Hanley (1843: 207). Unio arctior Lea. — Hanley (1843: 208). Unio arcula Lea. — Hanley (1843: 210). Unio arcus Conr. — Hanley (1843: 207). Unio arcæformis Lea. — Hanley (1843: 182). Unio asper Lea. — Hanley (1843: 179). Unio asperrimus Lea. — Hanley (1843: 178). Unio atrata Lea. — Hanley (1843: 199). Unio australis Lam. — Hanley (1843: 192). Unio barnesianus Lea. — Hanley (1843: 185). Unio batavus Lam. — Hanley (1843: 195). Unio bengalensis Lea. — Hanley (1843: 194). Unio bialata Desh. in Lam. — Hanley (1843: 214). Unio bilineatus Benson. — Hanley (1843: 207). Unio blandingianus Lea. — Hanley (1843: 200). Unio bonellii Ferussac. — Hanley (1843: 212). Unio brevidens Lea. — Hanley (1843: 198). Unio burroughianus Lea. — Hanley (1843: 197). Unio calceola Lea. — Hanley (1843: 212). Unio camelus Lea. — Hanley (1843: 184). Unio camptodon Say. — Hanley (1843: 198). Unio capsaeformis Lea. — Hanley (1843: 191). Unio carbonarius Lea. — Hanley (1843: 184). Unio cariosus Say. — Hanley (1843: 190). Unio castaneus Lea. — Hanley (1843: 188). Unio childreni Gray. — Hanley (1843: 193). Unio circulus Lea. — Hanley (1843: 201). Unio claibornensis Lea. — Hanley (1843: 192). Unio clavus Lam. — Hanley (1843: 187). Unio coccineus Lea. — Hanley (1843: 203). Unio complanata Barnes. — Hanley (1843: 210). Unio complanatus Lea. — Hanley (1843: 199). Unio compressus Lea. — Hanley (1843: 174). Unio confertus Lea. — Hanley (1843: 200). Unio confragosa Say. — Hanley (1843: 210). Unio congaræus Lea. — Hanley (1843: 200). Unio conradicus Lea. — Hanley (1843: 176). Unio contradens Lea. — Hanley (1843: 209). Unio cooperianus Lea. — Hanley (1843: 180). Unio cor Conr. — Hanley (1843: 187). Unio cornutus Barnes. — Hanley (1843: 179). Unio corrianus Lea. — Hanley (1843: 207). Unio corrientesinsis [sic] d’Orbig. — Hanley (1843: 212). Unio corrugatus Lam. — Hanley (1843: 197). Unio crassidens Lam. — Hanley (1843: 184). Unio crassissimus Fer. — Hanley (1843: 209). Unio crassus Say. — Hanley (1843: 192). Unio cresserus [sic] Lea. — Hanley (1843: 196). Unio cumberlandianus Lea. — Hanley (1843: 195). Unio cuprinus Lea. — Hanley (1843: 208). Unio cylindricus Say. — Hanley (1843: 182). Unio cæruleus Lea. — Hanley (1843: 194). Unio cœlatus Conr. — Hanley (1843: 175). Unio decisus Lea. — Hanley (1843: 187). Unio declivis Say. — Hanley (1843: 200). Unio dehiscens Say. — Hanley (1843: 204). Unio delodontus Lam. — Hanley (1843: 194). Unio deltoidea Lea. — Hanley (1843: 211). Unio depressus Lam. — Hanley (1843: 200). Unio discoideus Lea. — Hanley (1843: 214). Unio discus Lea. — Hanley (1843: 197). Unio divaricatus Lea. — Hanley (1843: 197). Unio dolabræformis Lea. — Hanley (1843: 189). Unio donaciformis Lea. — Hanley (1843: 183). Unio dorfeuillianus Lea. — Hanley (1843: 179). Unio dromas Lea. — Hanley (1843: 181). Unio ebenus Lea. — Hanley (1843: 202). Unio egyptiacus [sic] Cail. — Hanley (1843: 198). Unio elegans Lea. — Hanley (1843: 183). Unio ellipsis Lea. — Hanley (1843: 188). Unio emarginatus Lea. — Hanley (1843: 210). Unio faba d’Orbig. — Hanley (1843: 197). Unio fabalis Lea. — Hanley (1843: 196). Unio fabula Lea. — Hanley (1843: 213). Unio fisherianus Lea. — Hanley (1843: 206). Unio foliatus Hildreth. — Hanley (1843: 176). Unio folliculatus Lea. — Hanley (1843: 204). Unio fossiculiferus Lea. — Hanley (1843: 213). Unio fulvus Lea. — Hanley (1843: 200). Unio gibber Lea. — Hanley (1843: 185). Unio gibbosus Barnes. — Hanley (1843: 207). Unio glaber Lea. — Hanley (1843: 196). Unio glans Lea. — Hanley (1843: 196). Unio globosus Lea. — Hanley (1843: 189). Unio gracilis Barnes. — Hanley (1843: 174). Unio graniferus Lea. — Hanley (1843: 180). Unio granosus Brug. — Hanley (1843: 182). Unio grayanus Lea. — Hanley (1843: 177). Unio greenii Conr. — Hanley (1843: 191). Unio griffithianus Lea. — Hanley (1843: 199). Unio guarayana Lea. — Hanley (1843: 213). Unio haysianus Lea. — Hanley (1843: 188). Unio heros Say. — Hanley (1843: 175). Unio heterodon Lea. — Hanley (1843: 183). Unio hildrethianus Lea. — Hanley (1843: 196). Unio holstonianus [sic] Lea. — Hanley (1843: 213). Unio hopetonensis Lea. — Hanley (1843: 198). Unio hydianus Lea. — Hanley (1843: 192). Unio inflatus Lea. — Hanley (1843: 174). Unio infucatus Conr. — Hanley (1843: 203). Unio interruptus Lea. — Hanley (1843: 191). Unio iris Lea. — Hanley (1843: 206). Unio irroratus Lea. — Hanley (1843: 181). Unio jayensis Lea. — Hanley (1843: 206). Unio jejunus Lea. — Hanley (1843: 199). Unio kirklandianus [sic] Lea. — Hanley (1843: 203). Unio lachrymosus [sic] Lea. — Hanley (1843: 177). Unio lamellatus Lea. — Hanley (1843: 194). Unio lanceolatus Lea. — Hanley (1843: 204). Unio lecontianus Lea. — Hanley (1843: 188). Unio leeai [sic] Gray. — Hanley (1843: 182). Unio lens Lea. — Hanley (1843: 201). Unio lienosus Conr. — Hanley (1843: 194). Unio littoralis Lam. — Hanley (1843: 201). Unio lugubris Lea. — Hanley (1843: 206). Unio luteolus Lam. — Hanley (1843: 192). Unio lævissimus Lea. — Hanley (1843: 174). Unio maculatus Conr. — Hanley (1843: 203). Unio margaritiferus Drap. — Hanley (1843: 213). Unio marginalis Lam. — Hanley (1843: 206). Unio marginata Lea. — Hanley (1843: 211). Unio masoni Conr. — Hanley (1843: 201). Unio medellinus Lea. — Hanley (1843: 193). Unio membranacea Lea. — Hanley (1843: 202). Unio menkianus Lea. — Hanley (1843: 191). Unio metanever [sic] Lea. — Hanley (1843: 179). Unio minuanus Lea. — Hanley (1843: 213). Unio modioliformis Lea. — Hanley (1843: 209). Unio monodontus Say. — Hanley (1843: 210). Unio muhlfeldianus Lea. — Hanley (1843: 196). Unio multiradiatus Lea. — Hanley (1843: 190). Unio multistriatus Lea. — Hanley (1843: 176). Unio murchisonianus Lea. — Hanley (1843: 177). Unio nashvillianus Lea. — Hanley (1843: 193). Unio nasutus Say. — Hanley (1843: 206). Unio nicklinianus Lea. — Hanley (1843: 175). Unio niloticus Cail. — Hanley (1843: 197). Unio nodulosus Lea. — Hanley (1843: 180). Unio notatus Lea. — Hanley (1843: 193). Unio novi eboraci Lea. — Hanley (1843: 190). Unio novæ hollandiæ Gray. — Hanley (1843: 182). Unio obesus Lea. — Hanley (1843: 198). Unio obliquus Lam. — Hanley (1843: 186). Unio obscurus Lea. — Hanley (1843: 194). Unio occidens Lea. — Hanley (1843: 189). Unio ochraceus Say. — Hanley (1843: 190). Unio olivarius Lea. — Hanley (1843: 195). Unio orbiculatus Hildr. — Hanley (1843: 192). Unio ovatus Say. — Hanley (1843: 184). Unio paraguayana d’Orbig. — Hanley (1843: 212). Unio parallelopipedon Lea. — Hanley (1843: 205). Unio paranensis Lea. — Hanley (1843: 202). Unio parchappii Lea. — Hanley (1843: 212). Unio parvus Barnes. — Hanley (1843: 196). Unio patagonicus d’Orb. — Hanley (1843: 208). Unio patulus Lea. — Hanley (1843: 187). Unio pectorosus Conr. — Hanley (1843: 189). Unio penitus Conr. — Hanley (1843: 183). Unio perdix Lea. — Hanley (1843: 188). Unio perovalis Conr. — Hanley (1843: 191). Unio perovatus Conr. — Hanley (1843: 190). Unio perplexus Lea. — Hanley (1843: 181). Unio personatus Say. — Hanley (1843: 202). Unio phaseolus Hild. — Hanley (1843: 207). Unio philipsii [sic] Conr. — Hanley (1843: 178). Unio pictorum Lam. — Hanley (1843: 205). Unio pictus Lea. — Hanley (1843: 191). Unio pileus Lea. — Hanley (1843: 185). Unio platyrrhinchus [sic] Rossm. — Hanley (1843: 205). Unio plicatus Say. — Hanley (1843: 175). Unio pliciferus Lea. — Hanley (1843: 176). Unio ponderosus Lea. — Hanley (1843: 177). Unio productus Conr. — Hanley (1843: 205). Unio pulcher Lea. — Hanley (1843: 193). Unio pumilus Lea. — Hanley (1843: 185). Unio purpuratus Lam. — Hanley (1843: 208). Unio pustulatus Lea. — Hanley (1843: 178). Unio pustulosus Lea. — Hanley (1843: 180). Unio pyramidatus Lea. — Hanley (1843: 186). Unio radiata Conr. — Hanley (1843: 212). Unio radiatus Lam. — Hanley (1843: 193). Unio rangianus Lea. — Hanley (1843: 187). Unio ravenelianus Lea. — Hanley (1843: 187). Unio recta Lam. — Hanley (1843: 204). Unio retusus Lam. — Hanley (1843: 202). Unio rhombeus Wagn. — Hanley (1843: 208). Unio roanoakensis [sic] Lea. — Hanley (1843: 199). Unio rotundatus Lam. — Hanley (1843: 201). Unio rubellus Conr. — Hanley (1843: 201). Unio rubiginosus Lea. — Hanley (1843: 185). Unio rugosa Barnes. — Hanley (1843: 211). Unio schoolcraftensis Lea. — Hanley (1843: 178). Unio securis Lea. — Hanley (1843: 184). Unio shepardianus Lea. — Hanley (1843: 203). Unio simus Lea. — Hanley (1843: 197). Unio smithii Gray. — Hanley (1843: 195). Unio solidus Lea. — Hanley (1843: 186). Unio sowerbianus Lea. — Hanley (1843: 185). Unio spinosus Lea. — Hanley (1843: 182). Unio splendidus Lea. — Hanley (1843: 190). Unio stapes Lea. — Hanley (1843: 179). Unio stramineus Conr. — Hanley (1843: 209). Unio subovatus Lea. — Hanley (1843: 184). Unio subrotundus Lea. — Hanley (1843: 203). Unio subtentus Say. — Hanley (1843: 176). Unio sulcatus Lea. — Hanley (1843: 188). Unio swananoensis. — Hanley (1843: 211). Unio taitianus Lea. — Hanley (1843: 186). Unio tampicoensis Lea. — Hanley (1843: 188). Unio tappanianus Lea. — Hanley (1843: 209). Unio tenerus Rave. — Hanley (1843: 209). Unio tenuissimus Lea. — Hanley (1843: 206). Unio tetralasmus Say. — Hanley (1843: 198). Unio tragosus [sic] Conr. — Hanley (1843: 178). Unio trapezoides Lea. — Hanley (1843: 176). Unio triangularis Barnes. — Hanley (1843: 183). Unio trigonus Lea. — Hanley (1843: 185). Unio troostensis Lea. — Hanley (1843: 186). Unio truncatus Swain. — Hanley (1843: 187). Unio tuberculatus Barnes. — Hanley (1843: 182). Unio tumidus Retz. — Hanley (1843: 205). Unio turgidus Lea. — Hanley (1843: 180). Unio tæniatus Conr. — Hanley (1843: 191). Unio undulata Say. — Hanley (1843: 211). Unio undulatus Barnes. — Hanley (1843: 175). Unio vanuxemensis Lea. — Hanley (1843: 193). Unio variabilis Lea. — Hanley (1843: 202). Unio varicosus Lea. — Hanley (1843: 181). Unio vaughanianus Lea. — Hanley (1843: 208). Unio ventricosus Barnes. — Hanley (1843: 189). Unio venustus Lea. — Hanley (1843: 192). Unio verrucosus Barnes. — Hanley (1843: 180). Unio vibex Conr. — Hanley (1843: 195). Unio ziczac [sic] Lea. — Hanley (1843: 183). Unio zieglerianus [sic] Lea. — Hanley (1843: 193). Unio æsopus Green. — Hanley (1843: 181).